VietNamNet Bridge – There is room for further co-operation between the US and Viet Nam in developing aviation infrastructure, safety and security, industry officials said at a conference held on Wednesday in HCM City. 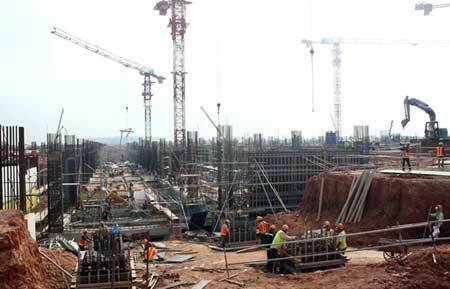 The construction site of Terminal 2 at Noi Bai International Airport. Viet Nam and the US plan to co-operate and develop aviation infrastructure, safety and security. Le Manh Hung, general director of the Airport Corporation of Viet Nam, said the country’s aviation industry had developed well despite the impact from the global economic crisis, with a higher annual growth rate than other sectors. “The number of domestic and international passengers has risen but Viet Nam’s aviation sector still faces challenges as it is somehow influenced by an economic downturn and infrastructure development. Infrastructure for aviation should be further improved to meet travel demand,” he said. According to the Airport Corporation of Viet Nam, which manages 22 airports nationwide, the number of passengers has increased by 10-15 per cent each year in recent years. Last year, there were 38 million passengers and this year, 44 million are expected. Cargo via air totalled 650,000 tonnes in 2012, and the figure is expected to be 730,000 for 2013. Major airports are still overloaded, including Noi Bai International Airport in Ha Noi, which transports 12 million passengers each year. 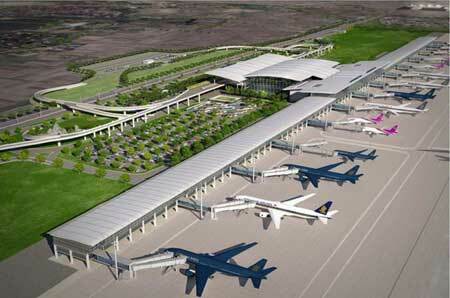 A new international terminal at Noi Bai is under construction and is expected to be completed in December next year. The newly built international terminal with a capacity of 10 million passengers at Tan Son Nhat International Airport is overloaded. Hung estimated that by 2020 there would be 25 million passengers served at the airport. Expansion of the domestic terminal at HCM City’s Tan Son Nhat Airport is also being planned. However, when annual passengers reach 25 million, there will be no remaining space to expand the airport. Because of this, the Long Thanh International Airport has been proposed. A vote by the National Assembly on this airport will be taken by the end of the year. In addition, Vietnam Airlines has unveiled its plan to have a fleet of 85 planes by 2014, and 150 by 2020. Between 2014 and 2020, the airline will recruit 100 – 150 pilots and 200 – 250 technicians each year. At the conference, several American aviation companies expressed their concern about the development of the market in Viet Nam. Captain Alex Fecteau, programme manager and project engineer at US-based Boeing Company, said the market was developing in Viet Nam as well as the rest of Asia. At the US-Viet Nam Aviation Co-operation Working Group held yesterday in HCM City, Rena Bitter, the US Consul General in HCM City, said the event reinforced the fact that two governments had a growing and dynamic partnership in the aviation industry. “The US and Viet Nam’s co-operation in the aviation industry is robust,” she said. Bitter said the US Trade Development Agency provided over US$1 million in funding to the Civil Aviation Administration of Viet Nam to support its safety efforts. The conference heard representatives from US aviation companies and US government experts from the Federal Aviation Administration (FAA) sharing their expertise to facilitate the goal of aviation progress in Viet Nam. The conference focused on best practices in airport operations, including maximising airport traffic management to increase capacity, public-private partnership opportunities in Viet Nam’s aviation sector, and aircraft certification. According to Le Van Tang, head of the Bidding Management Department at the Ministry of Planning and Investment, demand for annual capital to develop aviation infrastructure is estimated at $8 billion. Tang said that two aviation projects are calling for public-private partnerships, including the $250-million Van Don Airport in northern Quang Ninh and the $5.62-billion Long Thanh Airport in southern Dong Nai. The latter would carry 100 million passengers a year.